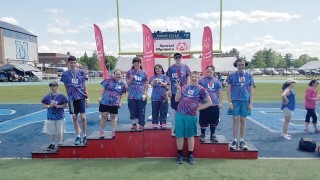 Nine Windham/Raymond Special Olympians participated in the Special Olympics State Summer Games held at the University of Maine at Orono on Friday, June 8th through Sunday, June 10th. Approximately, 1,500 athletes, ages six and up, participated from across the state of Maine. Friday’s events began with an outside barbeque and a parade that was followed by opening ceremonies that included the lighting of the torch. Each RSU14 athlete participated in three individual events and eight of the athletes participated in team relays. The first event on Friday was the team relays in which RSU14 brought home a silver and bronze medal. Saturday was full of many individual events including the softball throw, the shot put, running and standing long jumps and other running events. The day concluded with a Hawaiian themed dance. 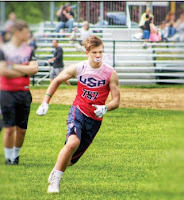 In preparation for this summer game event, the athletes had been training twice a week with Coach, Anne Blake throughout the months of May and June. “It is rewarding to see the smiles on all the athletes faces, win or lose and how they all showed great sportsmanship to all the other athletes,” remarked Coach Blake. Congratulations to the RSU14 participants on a tournament well done! Two Majors Little League Teams: CR Tandberg and Tricia Zwirner State Farm Insurance, faced off in the final round championship game on Sunday, June 17th at Ciccarone Field at Lowell Farm in Windham. Tricia Zwirner State Farm Insurance Team stayed alive in this double elimination tournament after beating CR Tandberg on Friday, June 15th 14-1. CR Tandberg was off to a powerful start in the top of the first inning with Briggs Vallerie #2 getting a base hit and Sam Foley #8 getting a triple. Ryan Bernard #7 gets thrown out at first but brings in Vallerie and Foley. Score: 2-0 CR Tandberg. State Farm responds with Ethan Barker #11 crushing the ball over the fence; Score now 2-1. Fast forward to the top of the third inning: Josh Tom #3, and Vallerie get base hits. After Foley walks, Bernard smashes a double into the outfield; 5-1, CR Tandberg. In the top of the fifth CR Tandberg continues their momentum. Anthony Cole #10, Ben Shaw #4 and Vallerie all get base hits. The scoreboard now reads 7-1, CR Tandberg. This remained the score until the end of the game. State Farm played a great game with Logan Marden #12 getting a double in the bottom of the fourth. They had great teamwork and made several excellent plays. A great effort was made by both teams. “The kids played great all year. After getting [beat] last game they showed a lot of heart and to come back and beat [State Farm] is impressive. I’m proud of all of them,” remarked Coach Patrick Foley. Congrats to both teams on an excellent season and the hard work it took to get to this game. Minors Little League Teams (ages 7-11) - Windham Powersports and Refuge Church took to the field for their championship game on Saturday, June 16th played at Ciccarone Field at Lowell Farm in Windham. Windham Powersports started strong, scoring five runs in the first inning. C.J. McDonald #8 got a double. Dominic Cataldi #6, Jacob Leavitt #3, Ellias Jaquari #2 and Ronin Rotaru #4 all got base hits. In the top of the second, McDonald rips an in-the-park home run adding two runs to the scoreboard, 7-0. Calvin Bartz #7 smashes a triple adding another run. Score now: 8-0, Windham Powersports. Windham Powersports continued in the top of the third with Jaquari, Rotaru, Cataldi and Collin Lombard #12, all getting hits. The inning closed with the score 13-0. Windham Powersports added a final run in the top of the fourth to end the game with a 14-0 score. 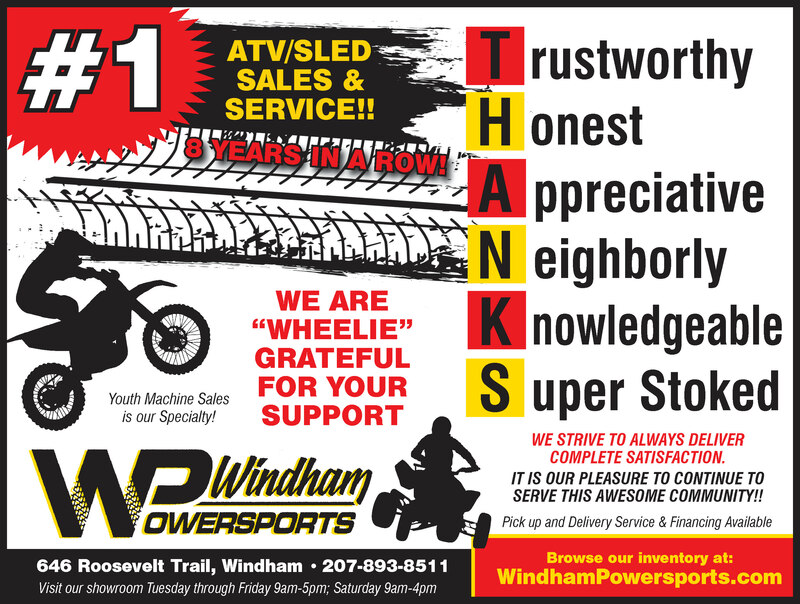 Windham Powersports had strong defense and excellent teamwork. Refuge Church battled hard as Evan Chojnowski #15 gets on first base and advances a runner to second base in the bottom of the second inning. They had good defense, making plays to first and working hard as a team to get the ball from the infield or outfield to where it needed to be. Great sportsmanship from these guys, too! “I am so pleased with how well these boys have advanced in their game, skills, sportsmanship and team spirit. It’s been a great, great season,” said Coach Chris McDonald. Congrats to both teams on an excellent season and the hard work it took to get to the championship game level. We here at The Windham Eagle are proud of all of you! Congratulations to Alex Wilkins of Windham for taking first place in the triple jump and long jump at the Maine State Track Meet in Bath on Saturday, June 2nd. Windham Eighth graders Tayshawn Lindsay and Jason Scott are no strangers to the football field. Lindsay has been playing since sixth grade and Scott has been playing since second grade. Their passion and dedication has paid off as they both recently made the U.S. National Football Team. Lindsay will be competing in July as a member of the that team in the Middle School Bowl Game Series in Canton, Ohio and Scott will be competing in the same series in Arlington, Texas. To try out for the U.S. National Team, Scott and Lindsay played in a two-day competition at Assumption College in Worcester, Massachusetts. The first day it was rainy, cold and wet, but these problematic conditions didn’t faze either athlete. “I was determined to make it to the next level, and although it was cold and wet I was focused on the game,” commented Lindsay. “I tried not to think about how cold it was and stay focused on the game,” remarked Scott. Shortly after trying out in Massachusetts, Lindsay and Scott were both very excited when they found out they made the team. They made a team that thousands from all over the country try out for but very few get asked to join. However, neither of them is nervous to play in this national tournament. “It’ll be more fun than nerve wracking – I can’t wait to play,” replied Lindsay. Scott was chosen for this tournament last year, and now that he knows what to expect, he’s not as nervous; though he does have some concern about playing in the heat. This competition gives both of these student athletes a glimpse of what they’re capable of. 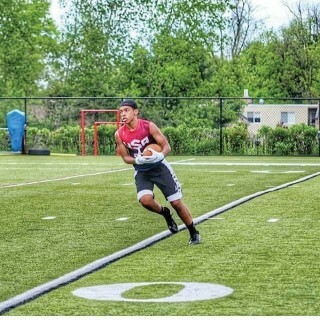 “After making a team made up of roughly 200 kids around the nation, I realized I am capable of furthering [my football career] if I keep working on my skills. It gives me more confidence,” said Scott. “I need to work harder to beat this guy or that guy…you want to be the first, you want to be the best. I think if I keep working I can use my skills towards a college scholarship,” noted Lindsay. The JV varsity softball teams travelled to Thornton Academy on Friday, May 25 to compete with the Trojans. hits. Lily Beaton, #7, ripped an in-the-park home run, putting three runs on the scoreboard. The bottom of the first brought Thornton Academy scoring two runs, but Windham ended the inning with Thornton runners on base. Shyler Fielding, #20, hit a triple in the top of the third, and brought in two runs. She then steals home making it 6-2 Windham. Windham scored two runs in the top of the fourth to make it 8-5, Windham; after Thornton scored in the previous inning. Windham brought the score, in the top of the fifth, to 10-6. The bottom of the fifth brought Thornton scoring ten runs and turning the tables, 16-10 Thornton. The Eagles fought back hard with Chloe Allen, #34. She delivered a double that scored a run for Windham, 16-11. Base hits by Colby, Beaton and Emilee Dehetre, #11, scored two more runs. Beaton stole home and the final score at this point is 16-14, Thornton. "I have a great group of girls who have worked incredibly hard to improve this season," said coach Raquel Gerry. "We out hit Thornton and played great defense; we just came up a little short in the end." This was one for the record books. After two innings Thornton was up 3-1. Windham fought back ending the top of the third at 3-2. Windham’s defense was outstanding, bringing up four batters and sending three away in the bottom of the third. The fourth inning brought Taylah Piazza, #9, Callie Fielding, #14 and Katelyn Troiano, #12, who all got base hits. Lauren Talbot, #4 got a hit that brought in Piazza and Fielding. The bases continued to be loaded after Erin Elder, #24 walked. Chloe Wilcox, #22, cranked a double into the outfield that brought in Talbot and Troiano. Elder then stole home to make it 7-3, Windham. Thornton responded by scoring three runs in the fourth. In the top of the sixth, Wilcox smashed a home run to center field. The score now was at 8-6 Windham and a bunt from Wilson in the seventh, scored Windham another run. Thornton tied the game at 9 in the bottom of the seventh. Talbot tagged up and scored in the eighth inning which brought Windham now to 10-9; but Thornton kept the game going by tying the game at 10-10. The next several innings were evenly matched back and forth with both teams playing strong defense. After twelve innings, Thornton stole home, making it 11-10.